With today’s version of an attention span, seven years is a long time to wait for a band to release a new record… unless you’re the band DOPE and have a numerous amount of supportive fans. Don’t call the gap between records No Regrets (2009) and Blood Money Part 1 (2016) a hiatus, because the band was far from being on a break. There wasn’t extensive touring but there were hundreds of shows and endless hours of writing and recording music. “For the first twelve years of this band, all I did was tour and make records and tour and make records. And I just kind of reached the point in my life where I realized that there was stuff missing. I can’t tell you how many birthdays, family member funerals, births of loved ones kids that I missed because all I did was tour and make records and everything in my life that wasn’t touring or making records was secondary,” said frontman Edsel Dope. The repetitive nature became a routine but after realizing the effect on his relationship with others, he knew he had to take a step back. In addition to figuring out the logistics of stepping back into a major tour routine, the band had to take something new into account: social media. There was no way to track daily movements of artists and for bands before that generation, it becomes hard to stay relevant. But as I said before, not every band is like DOPE. While they were not active on their Facebook page, they accumulated almost half a million likes. 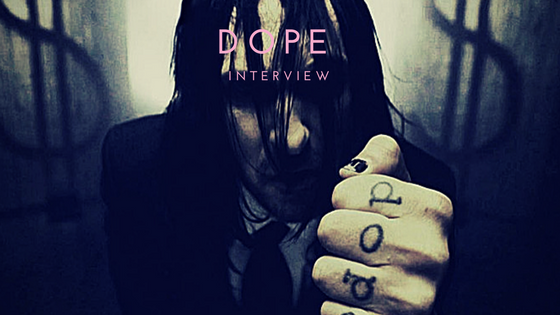 “I think that was another thing that really sort of reaffirmed to me that there was going to be a lot of support for us when [we] did come back,” Dope said. Since the band’s first record – released on cassette tape in 1999 – the entire music industry as a whole has shifted. After the years of relentless commitment and a well-deserved step back from the hype, Edsel said he finally felt that the timing was right to release the record and do a proper tour. However, there’s always that moment of doubt with what lies ahead. Blood Money Part 1 is quality music that once again proves why DOPE has stayed so relevant since their inception. The band has kept the highest quality content in all their recordings, whether they were attached to a label or independent. You won’t find many bands that produce major label-quality content and the fact that this record stays true to Edsel’s morals on that is fascinating. Much like the already anticipated Part 2 of this record, there is definitely an anticipation of a Part 2 of this interview.